I picked the last of my habanero peppers this weekend and was trying to decide what to make with them. 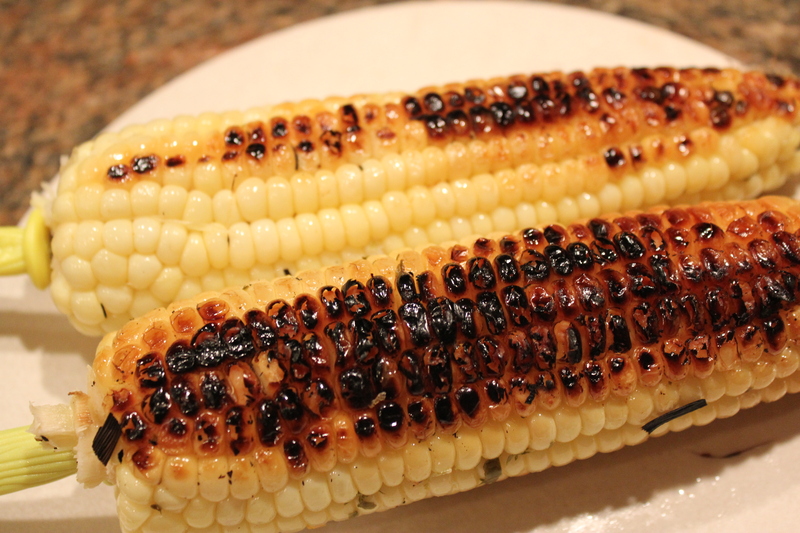 I ran across some nice looking Silver Queen corn on sale at Harris Teeter, so decided to grill it in its husks with a habanero-butter spread. We haven’t cooked much corn this summer since the kitchen has been out of commission, so I’m trying to take advantage of the last bit of it while I can. 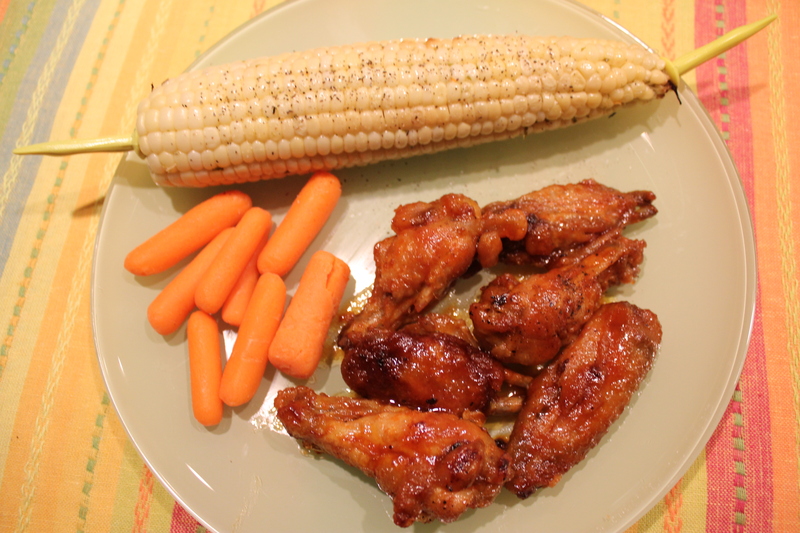 This corn was so tasty — grilling it brings out its sweetness and adds some smokiness, while the habanero pepper adds some heat. I liked the addition of the sweet basil as well, also fresh from my garden. Next time I may use a larger habanero — none of us, including Gabe and Lexi, thought it was too hot. 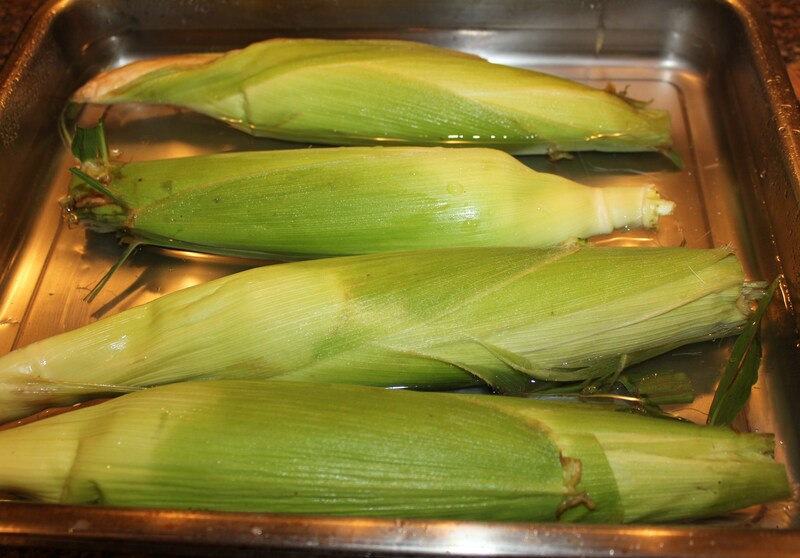 Soak the corn (husks on) in cold water for 20 minutes or so. If the water does not cover the corn completely, rotate the ears after 10 minutes. 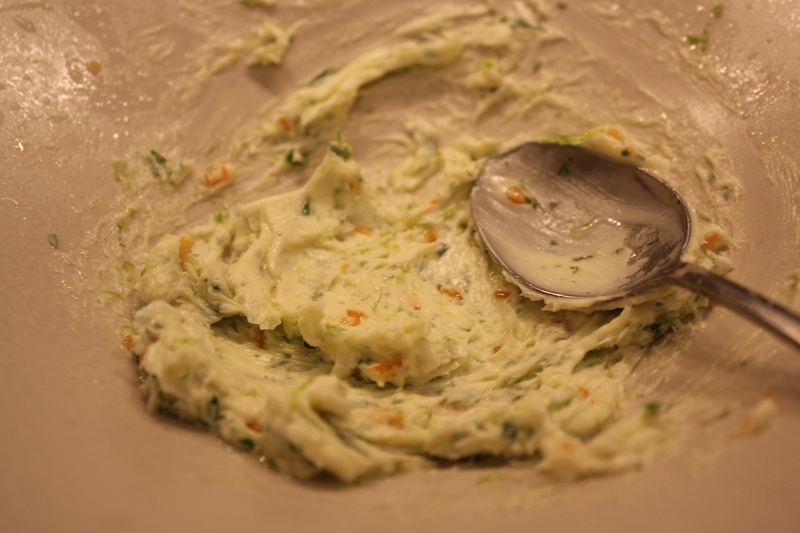 Combine the butter, lime juice and zest, habanero, garlic, basil and salt in a small bowl. Peel back the corn husks to about one inch from the bottom and remove all of the silk. 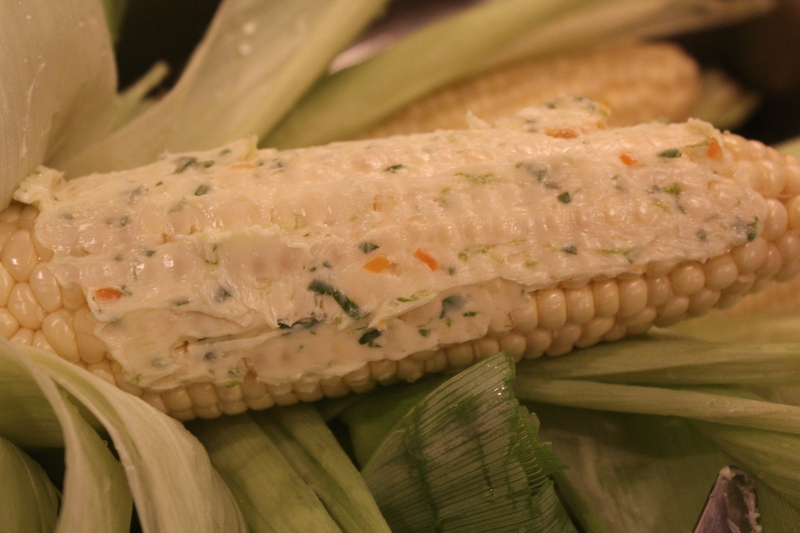 Spread the habanero butter over the corn. Rewrap the corn in the husks, trying to cover each ear completely so the butter doesn’t drain out. Grill for 25 minutes over medium heat, until the corn is tender. You should turn the corn every now and then. Carefully remove the husks and enjoy! I served this with Ronda’s Saucy Honey-Sriracha Chicken Wings that I blogged about earlier, but it makes a great side for burgers, fish, pork, etc. 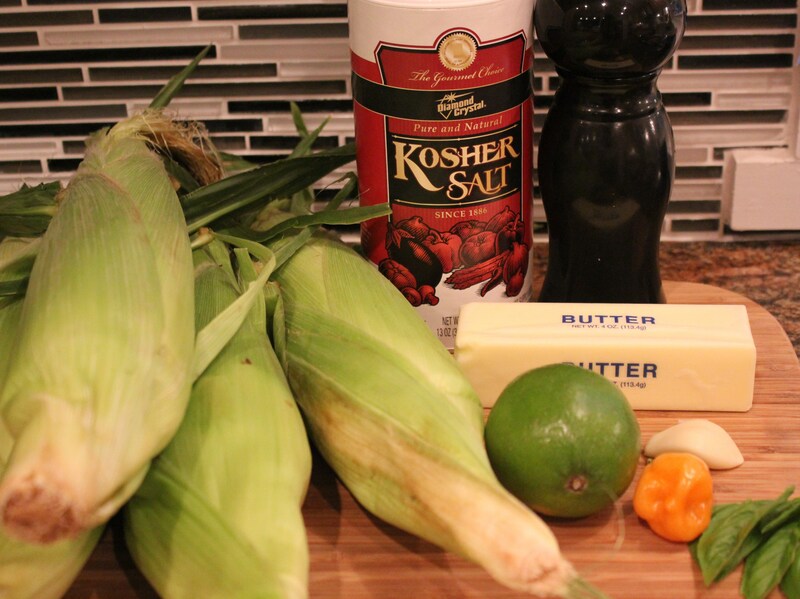 This entry was posted in Recipes, Vegetables/Vegetarian/Vegan and tagged eat drink and be merry, Grilled corn habanero butter, Grilled corn recipes, Habanero butter, Kelley Chisholm recipes, vegetarian recipes. Bookmark the permalink. Set up the grill for direct grilling and preheat to high.Strip back the husk, starting at the top of the ear of corn; the motion is rather like that of peeling a banana. Leave husk attached to the steam end. 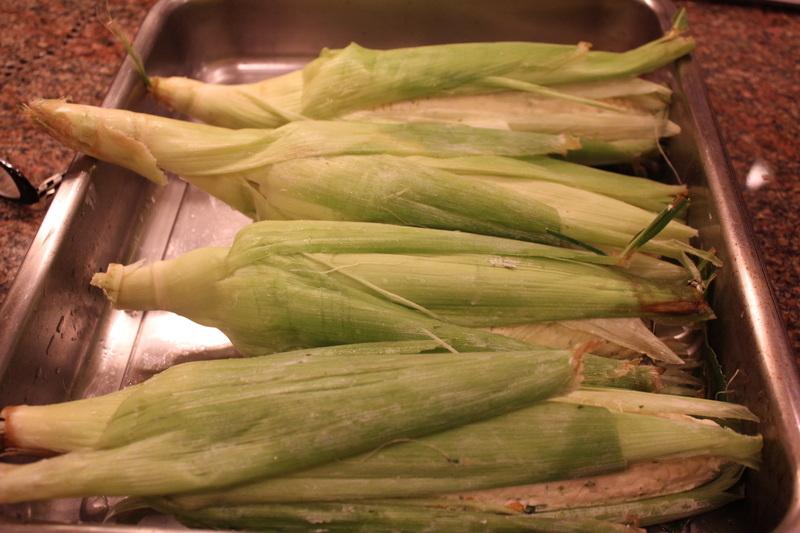 Remove corn silk and fold the husk back over the stalk. Tie the husk with string to form a handle.Place the butter, parsley, and garlic in a mixing bowl and whisk or beat until smooth and creamy.When ready to cook, lightly brush each ear of corn with a little of the garlic-parsley butter and arrange on the hot grate, positioning the ears in such a way that the husks are away from the fire or slide a sheet of aluminum foil under them. Grill the corn until the kernels are handsomely browned all over, 8 to 12 minutes in all, turning as needed, brushing with the remaining butter and seasoning generously with salt and pepper. 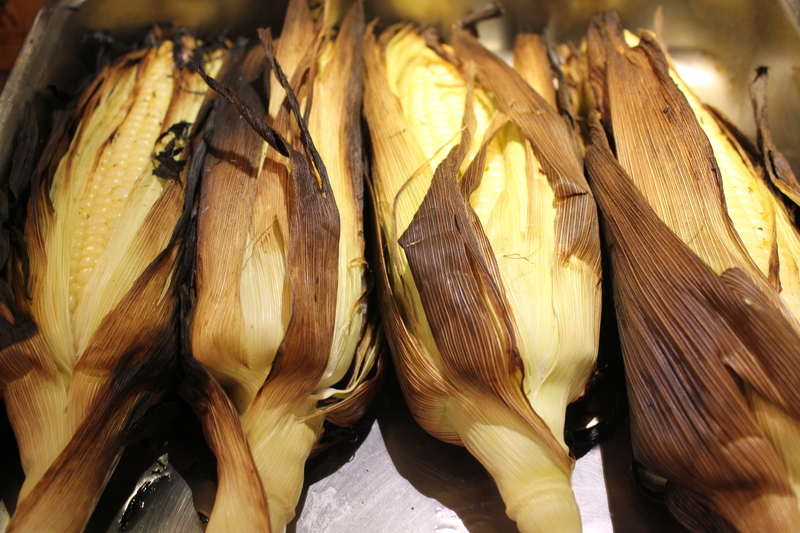 Remove the corn from the grill and serve at once.